Labo launched last week in North America, and you may well have noticed plenty of coverage going up on a wide range of sites since then. The consensus is pretty clear: Labo is a neat toy that has plenty of potential. So then, you may be wondering to yourselves, where's the all-important Nintendo Life review? Otherwise known as "the only review worth reading"? Unfortunately, because we're based in the UK, we won't be getting our hands on Labo proper until this Friday. While North America and Japan got Labo on the 20th April, the European launch is the 27th, presumably because cardboard is really difficult to manufacture in large quantities, or something. "Ah!" some of you may be thinking right now. "But I've noticed that several UK-based games writers already have their review kits - what gives, Nintendo Life? Huh? Huh?" You are of course correct, some UK-based outlets do have kits and are putting content live this week. However, we're not one of them - which means you'll have to wait a few more days before we deliver our verdict on Nintendo's new cardboard plaything. We'll also be reviewing the Variety Kit and Robot Kit separately to give you the most in-depth analysis out there. If you're in the US and have been tinkering away with Labo, let us know what you think by posting a comment below. I'm from Australia; 10/10 - Outstanding, absolute must buy. It should be literally illegal to own a Switch without buying a Labo kit! Its all forgotten. There's no hurry. I'll be patient. We’ve built the RC Car and fishing game. My kids like to punch out the parts but have me assemble them. It’s probably for the best. I’m amazed at the quality. It’s cardboard but the builds feel really solid and it’s crazy to hear cardboard parts literally click when you put them together. The fishing game is also extremely accurate. How they do it is beyond me. The software is a bit quirky requiring you to go thru the tutorial for each user who wants to play. It also requires you to go thru a lot of text dialogue to show you how to use the advanced features of the RC Car. Ok for kids but I wish I could just get the highlights without the dialog. Overall it’s fun, my kids like it, and I’m impressed with what those crazy folks at Nintendo can come up with. I bought the Variety Set for myself because I like DIY stuff. So far I finished the RC Car and the House. All the positive reviews out there are true—the real strength in Labo is the satisfaction in constructing each kit step by step, and Nintendo absolutely did not skimp on the interactivity bits. They may be constrained in scope, but they do all they need to in order to show off what the Joy-Cons are actually capable of. They go very far with the concept and it shows in the presentation of everything within, and it's clear that they have a lot further to go before it's mined completely. Really? NintendoLife is by far the best English language Nintendo fan site around. How can Nintendo NOT send you a review kit? Lame! I'm curious to see labo from the perspective of an adult gamer without kids. Garage looks interesting and I'm a programmer so that won't be hard but without the ability to make actual games it seems like all I'd be able to do it make neat little toys. Is my assessment correct? How are the actual games that come with it? Are they basically shovelware or do they have something there that could keep me entertained after completing the toycon? So far I've built 4 out of 5 of the variety kit. Just the piano to go. It is quite fun to put everything together. This easily puts lego to shame. Please Review the Variety Kits first. I wanna know how specific i can create my own music. Is that Piano = HD Mario Paint with Better Options & Tools ? Preorders are sold out most places around here anyway SO it's not like I'm at the edge of my seat here. I always think as NL as one of the biggest Nintendo voices on the internet (along with Gamexplain and GoNintendo), and definitely the biggest from the UK. Strange to think Nintendo hasn’t used such a media resource to promote what seems to be a pretty good product. You need some Imagination... ! I'm waiting for the drinking glass kit so that I'll finally have a use for those ice cubes rattling around inside my joy-con. I love the look of it and the strategy behind LABO is straight up genius. My only issue is the increased clutter it will bring to my modest sized home. Picked up the Variety Kit because I thought it would be a fun project to do with our kids and I have been very impressed. Thus far, we've only done the RC Car and Motorbike but there really is something for every age of kid, even during the building process (the youngest can punch out parts and make creases, the older ones can assemble, etc). The ways you put the cardboard together and the ways the controllers are used are nothing short of amazing. It seems more durable that I would have imagined and it all just fits together and works. The actual software is a lot of fun too. There's a lot of depth not necessarily in the "gameplay", but in terms of the additional tweaking and customization and ways you can use the cardboard toy once you're done with it, there's a lot there. If at a minimum you spend 2-4 hours building and experimenting with each of the projects, that's still 20 hours of "gameplay", though I expect most kids will get a lot more out of it than that. Plus I like how Nintendo hasn't hid anything behind the curtain, so to speak: the "Discover" mode tells you exactly what the hardware is doing with each project, how it all works, which is very cool. Anyway, the whole experience is very hard to describe until you actually get your hands on it with a bunch of enthusiastic kids (kids who like both Lego and video games and parents who like IKEA furniture would seem to be the target demographic) but so far I've been very impressed. Can't wait to do the piano! @Yorumi There is a new app called Fuze, which introduces newcomers to programming and lets you create simple programs and games. And when Labo was announced, there were people asking if you could can use the Switch's unique features (HD rumble, motion controls and IR camera) and the devs said that yes, you can. This opens more possibilities as you now have actual graphics to work with. So if you're looking for something more in depth, this might be the way to go. Me and my kids love it so far and we have only done the RC car. The game says it takes 15 minutes but we spent 3 hours just experimenting with things. We folded out a cereal box and traced the toy con pieces shapes to make more and have different versions of things. So fun!!! Its' sad Ninteod didn't get NL a copy but I can't see a review of this changing a lot of peoples minds either way. I am surprised Family Gamer hasn't covered Labo yet. It's like that guy went to the NY Toy Fair and hasn't covered a video game since Mario Odyssey. Maybe he got lost in the big city? Along with a lack of time and cash, the main reason I'm holding out on Labo is that I'm worried won't really be able to make full utility of its capabilities. The mini games and toys look like great fun, especially the Robot Kit, but the Toy-Con Garage feels like where the magic can really happen. Not sure if I'd be able to max out the potential... and yet I'm so anxious to try! The idea of cutting out your own shapes to make new creations is really tempting, along with reworking the concepts given to you. Reviews have me sold, but I'm curious about what NL thinks. 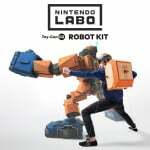 Preordered Labo on day one but I'm still looking forward to your review just for fun. So let me get this straight... Nintendo sends review copies of games to Nintendo life weeks in advance but they didn't send you a review copy of Labo? Also, Nintendo UK invited you to exclusive preview events, you even knew about Labo before it was revealed... yet they don't send you a review copy... How does that make any sense? "...presumably because cardboard is really difficult to manufacture in large quantities, or something." They are Green conscious in Japan. Thousands of trees were chopped down from Aokigahara forest to make LABO. Those trees need to be protected. Could you upload your creation to here, please ? No need to worry too much. I'm sure the Cardboard material are made of Recycled papers. If you concern about deforestation because of LABO, you should concern more about Unused cardboard from Supermarket. They are plenty of them, throwed, stomped, like a priceless things. @Nincompoop Screw the planet, I want my cardboard video games! I suppose that's the one plus if it doesn't become a success, it will be easy to dispose of further down the line. I personally want it to do great as it looks like a lot of fun and incredibly creative. @123akis I was thinking that too. Seems a bit odd. @Anti-Matter TheTetrisGuy is making fun of an IGN review for Pokeèmon Alpha Sapphire, where they lowered their review beczuse there was "too much water"
@invictus4000 Thanks for the quick review. I knew this is going to be fun. I will have to pick it up. @invictus4000 That's brilliant, and exactly I'm sure what Nintendo had in mind! @Nincompoop at least it's not made of plastic. That would be really polluting the planet. Wonder how many post-consumer content is used to made the cardboard. And like the packaging, where the software is housed in a simple packaging that wouldn't be out of place in a classroom, with a space for you to scribble in your name. Because Nintendo UK doesn't want to hold public connections to a site with a dysfunctional staff that gets into arguments with readers. Either that, or they're late as hell. Still, a durable good is still less polluting than a disposable good. "Recycling" is, and always has been a joke....a politically enforced joke, but a joke all the same....it takes more crude to "recycle" things than the reclaimed content. For metals and gasses that are scarce it makes sense to reclaim them no matter the energy cost, For WOOD, that grows and decays on it's own, it's muppet theater. Of course a REAL environmentally conscious civilization wouldn't be griping about cardboard vs. plastic toys and would have a bigger problem with the never-ending upgrade cycle of hardware, from PCs to phones to batteries to everything between. Heck, we'd be reverting to the pre-internet world. "I want to intentionally spend money on things that degrade quickly to save the Earth, while still feeling like a consumerist fad jumper!" is our current running philosophy. Or you could, you know, buy things that last a lifetime.....like people did decades ago. I only have the Variety Kit but it's a ton of fun! Highly recommend it. @invictus4000 Very creative! 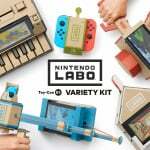 Nintendo would be happy to know how much fun that could be had out of their Nintendo Labo kits! @NEStalgia I'm quite confused as to how anyone thinks plastic would work instead. You can barely make creases in plastic, and popping out pieces would be a pain, let alone the folding and assembly. @Nintendo_Thumb a heat gun would work as well. We've got one here and it works well with corrugated plastic sheets. "Labo is taking away dev time from proper games!" "It's waaay too expensive! It's only cardboard!" "Lolz, ports and Labo - the Switch is dead." Nintendo didn't send a review kit to NL because they know we're a hard bunch to please. Just go to your local McDonalds.I am sure they have some old Happy Meal boxes you can use to build a robot suit out of, it's all the same. I'm rather hoping my girlfriend understands why with my birthday in 2 weeks, I keep showing her cat vs labo videos. Bought the Robot Labo. It's great. And the game is very deep. Many different levels and worlds to explore. Clever moments where you will need to use flying, kicking, even turn down the visor to see invisible items. Think in terms of leveling up and getting high scores to truly enjoy this game. Nintendo made this cool video that shows the deepness of the game, the many levels, the new moves and power ups. Also, if you get two persons with robot kits, you can fight each other ROCKEM' SOCKEM'' ROBOT style (if they can make this online, WOW). Um, little question for Toy Con ROBO. Is the string for moving the Joy Cons can be adjusted with my height 180 cm ? Also, is the backpack fit enough for adults ? I'm sure the supply of Cardboard are NOT from that forest. 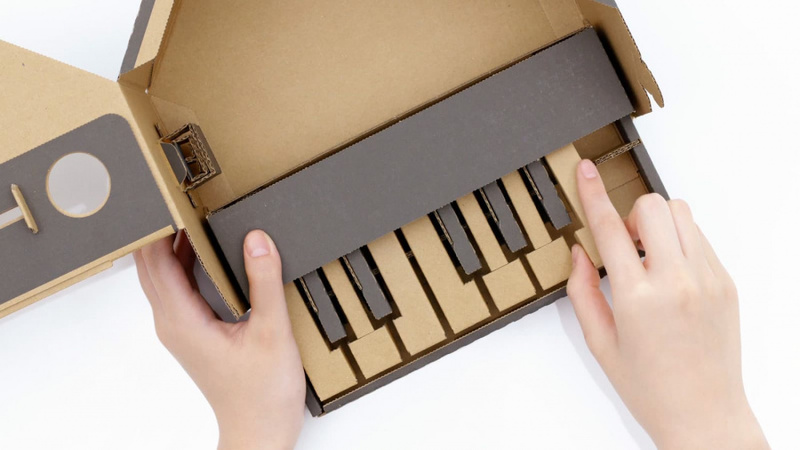 Beside, you can make a NEW Cardboard from Recycled Old Cardboard. No need to deforest the woods. @Nincompoop Preorder now, the new, Logan Paul approved, Haunted Labo Toy-Con Kit! @pullmyfinger Definitely interesting. I'm probably going to end up getting it just havn't yet made my final decision. There's different plastics though. There's corrugated plastic. Structured similar to cardboard but more durable/waterproof. It can crease just fine. Thin-sheet plastic holds a crease OK (but that's what Labo Duct-Tape(TM) is for!) It can still be damaged/bentbroken, but generally not as final as cardboard. @Nincompoop LOL, sadly the reference went right over my head after all the people who really do think that buying disposable things saves the Earth, I just kind of saw it at face value! Yes, new paper manufacture has energy cost as well, and that has to factor in, but as it's source to origin with other useful products produced from the process compared to recycling of paper, it's a pale argument. The strings are a perfect fit for me (though close to the end for me). That being said, easy to extend with a sturdy pair of shoe-laces by simply tying to the end. Though you would need to be 6 foot 5 and above to be concerned about that! Labo is the most fun I've had this year so far.